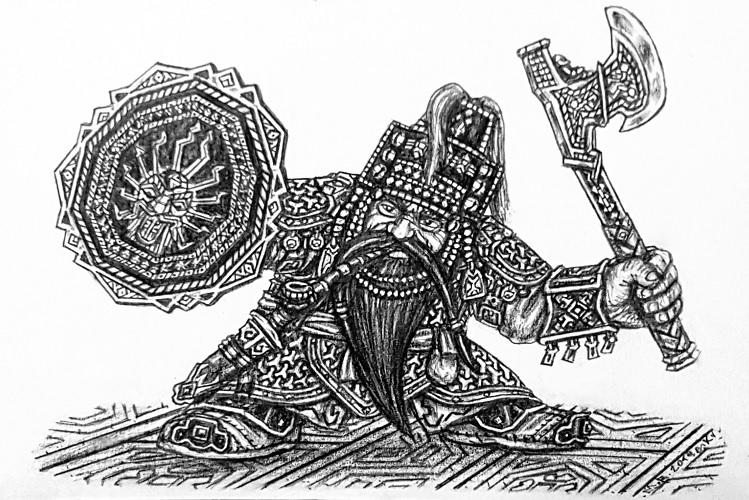 Ladies and gentlemen, let us better not leave eastern Augea without some Dwarven presence: That would be all too predictable run-of-the-mill poor form for a fantasy setting. 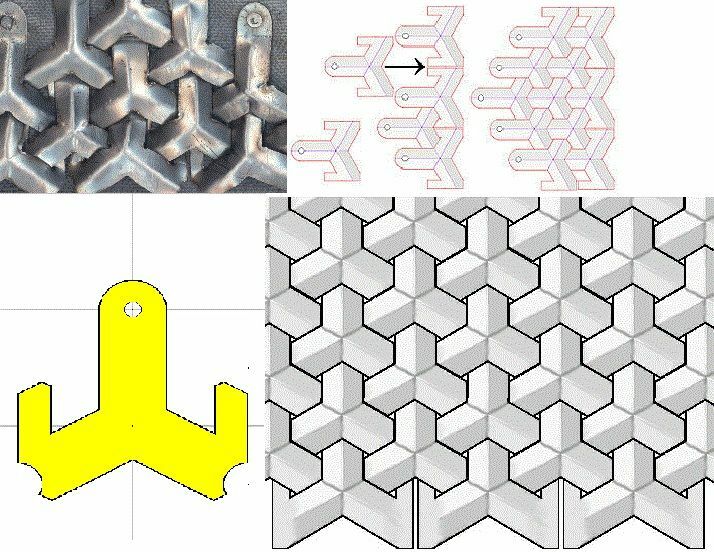 Although the equivalent of Korea could work well as a basis given their history of innovation (most famously with the turtle ships employed during two 1590s Japanese invasions of Korea), the lack of mountains there on the world map would seem to advise to leave Korea be for fantasy Human duty (and likewise we cannot infringe upon the equivalent of Japan/Nippon, wa or not). As such, let us instead turn to the highlands of Southeast Asia with its hill tribes, who can serve well as basis both for Human, Dwarf and Greenskin peoples in this region of the Ninth Age World. In the case of the above concept drawing, the Akha has been used for aesthetic inspiration, along with the bronze age Dong Son culture and the distinct Shan Wei Kai type of armour from Song dynasty China. During the long First Age, the Saurian Ancients of great Aotarakoa imported and bred Dwarf Slaves, whom they drove by whip and claw to mine the southern Sky Mountains for valuable minerals. The Skyhammer that set all slaves free did likewise in these parts of Augea, and these easterly Dwarves eastblished kingdoms all along the range of the southern Sky Mountains, and very slowly their prospectors and settlers began to work their way northward, under this massive mountain range. However, the ages of chaos anad barbarity that followed, took a heavy toll on the Dwarrows of the Sky Mountains, and through many millennia of ceaseless back-and-forth warfare (filled with setbacks and temporary reconquests) they were eventually driven out of almost all their ancestral holdings. Refugees fled east, away from the overrun Holds and into the Sky Foothills that extended in a southeastern spur from the mountains, and bolstered the small and humble mining and hunting colonies which settlers had already established in these highlands. What had once been their backwater periphery, now became their living homeland, and the Dwarves of the Sky Foothills fought tooth and nail to defend their kin and survive out in these harsh environs. At length, their industrious work and relentless warfare halted their long and steep decline, and at last these easterly Dwarves were reasonably secure in their fortified foothill Holds. Their legends abound with the great and lost splendour of the southern Sky Mountains which their ancestors once peopled, though in truth the Dwarves of the Sky Foothills have managed to carve out respectable Holds in their own right, filled with the brilliance and ingenuity which Dwarven hands have wrought, and sporting large underground halls and tunnel networks. Despite their living glory, these Dwarves consider themselves petty for having been forced out of the soaring Sky Mountains and forced to live in their shadow. In their hearts smoulder a desire to reclaim their lost kingdoms or at least find their lost treasures, and occassionally small bands of adventurers set out westward during times of strength, plenty and booming population. Most such expeditions do not return, but disappear amid the fabled peaks that spear the underbelly of the sky, brought low by much the same savages that conquered their original homeland. The most northerly of the Sky Foothill Dwarves have been pulled strongly into the orbit of Longjing. Although their instinct to resist the Human expansion at all costs was strong and initially resulted in some fierce highland wars against Tsuandan frontier armies, the bitter wisdom learnt from the humiliation and catastrophic loss of their ancestors contributed greatly to these northern hill Dwarves eventually kowtowing to the Emperor, accepting the suzerainty of a Human overlord, with some retained autonomy of their own. Occassionally, heavily armoured contingents of vassal Sky Foothill Dwarves can be seen marching with the Imperial Banners of Grand Tsuandan, and more than one host of foes at distant fronties have been annihilated amid their surprise at facing the pent-up wrath of these warlike and unexpected Dwarf auxiliaries. Many centuries of constant warfare have shaped the culture of these highlander Dwarves into a martial one. Their boys and menfolk practice violent forms of wrestling and boxing to build up strength and better overcome enemies in a tight struggle, and their heavily fortified Holds and clan outposts resound to the weapon practice of young and old alike. For the Dwarves of the Sky Foothills know all too well that war may utterly ruin the losing party. And so they fight to live and live to fight, and harbour hateful grudges indeed against those filthy hordes that overran their ancestral mountain homes. As of late, these old scars have been opened raw anew. For the Dwarven Holds of the Sky Foothills were outraged at finding their benighted cousins from the west construct the Steel Road right through the heart of their lost homeland. 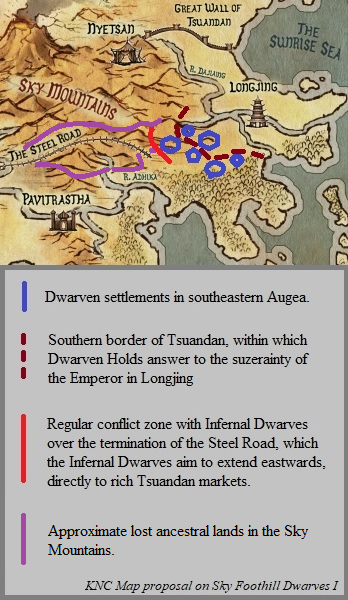 As the Steel Road gnawed closer to their highlands, many Holds (both independent ones and those under the formal yoke of Tsuandan) have repeatedly sent money, arms and contingents of vengeful warriors, who band together in the westmost Sky Foothills and set out to attack the Infernal Dwarves that build and guard the infamous Steel Road. The slavemasters have found themselves bogged down in this area, being forced multiple times to repair sabotaged sections of track, replace lost slave labour and send out armies to safeguard the Steel Road and strike preemptively at the tenacious Dwarrows of the Sky Foothills.